That’s one of my main goals. Don’t get stuck. I have to figure out how to move forward – even when I don’t want to. It’s not easy. 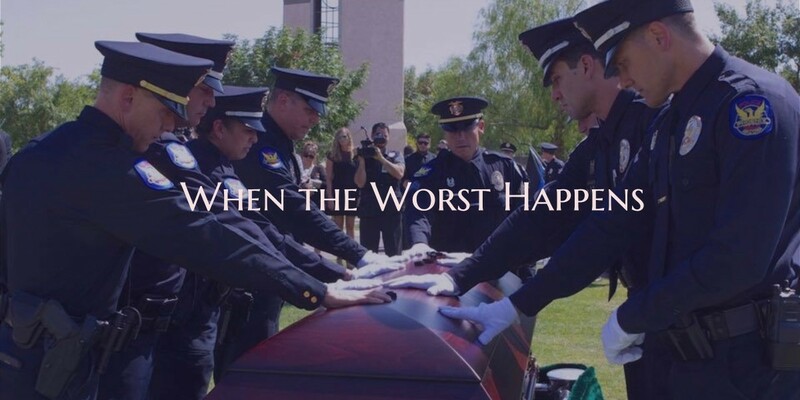 My world shattered when my son, David Glasser, who was a Phoenix Police Officer, was killed in the line of duty on May 18, 2016. Each day that followed was empty and the pain intensified each night. My mind wanted to focus on all of my broken dreams. The future I had expected was filled with fun and great times that were never going to happen. What I had lost created a huge hole in every hour of every day. And I wanted to stay there. That felt like the place I was supposed to be…..
Until I looked at my little grand darlings, Davey’s son and daughter. They have their whole lives to live and their lives cannot be all about what they have lost. Their future is bright and full of possibilities and I need to be a positive, encouraging part of that future. I also looked at the rest of my family. We have all been left behind on this earth to accomplish what God has planned for us. We have a purpose. We’re not supposed to get lost in the dark places on this road and live there the rest of our short time on this planet. So it became one of my goals – don’t get stuck. It’s not easy, moving forward. As the list of things Davey is missing grows, so does the sadness of not having him here. As the years go by I lose more and more parts of him and it hurts. There are days when I don’t want to go forward because it’s just too much of a struggle. But it’s worth it. I have met many people on this tough journey whose worlds have been blown apart by a tragedy…. and they are still living in that tragedy every day. They are stuck. They are angry and bitter and negative. Honestly, they just are no fun to be around. They have traded the good things of today for the pain of yesterday. They have refused to rebuild their dreams for the future and they are mired down in the dark times of the past. I know that getting stuck and living like that would be easy to do. But I’m refusing to go there. I have found that it really helps me to focus my mind on all the good things I had and all the good things I still have. When my thoughts start to dwell on all of the good things I have lost, I have to stop myself. None of that thinking is helpful. That is the slippery slope that slides into the muck where people get stuck. Being a part of the David Glasser Foundation has also helped me move forward. Honoring Davey’s legacy and doing positive things in his name really helps the future look brighter. There is still a lot of work to be done. Not everyone wants to start a foundation, but I have suggested to other people who have experienced a huge loss to think about possible ways they could honor the memory of the person they lost and create a positive future. College scholarships are a great option to remember someone who loved education and help someone else reach their educational goals. Sports scholarships are also great to remember someone who loved sports and give other kids a chance at reaching their dreams. One of my favorite things about the David Glasser Foundation Basketball league we had this past spring was the fact that we were able to give 10 scholarships to kids that would normally have not been able to be a part of league because of the registration costs. Positive things like that can change the trajectory of the life of a child – especially if they live in a high-crime area. Rebuilding a positive future. That’s the goal. That’s the struggle.